Another week has passed, and that means it is time for another Adventure in Monotangles. Over the last week I have been thinking about my CZT training class, and the great time I had, and the great people I met there. This helped me decide on the tangle for this week. While at the class we spent a decent amount of time on Betweed, a tangle I had not done before my CZT class. I had trouble with it for a while, but now I really enjoy it. I know there are many who have a love/hate relationship with Betweed, but that is part of what this adventure is all about. 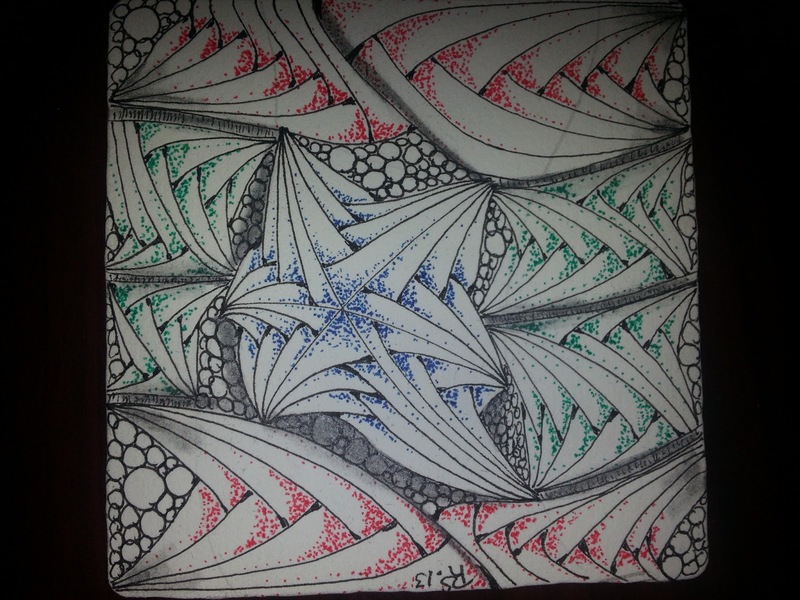 Remember Zentangle® should not cause stress, just watch the video, relax, breath and let betweed flow from your pen. Once you get it, it really is simple, and very relaxing. Here is the Tangle Patterns page for Betweed. love the way you added the colors! You did a great job with Betweed, Roy! I do have a question however; next to Betweed you have drawn some dots (Stipple?) and i wonder if it is still a monotangle. The little round dots, are Perfs. One of a handful of Tangle enhancers. I believe that they are not a tangle of their own, so can be used. However; that is my belief, and what is most important, is that you are happy with your own Monotangle and what you have created. If you feel as I do, use any of the enhancer, if not do not use them, the choice is yours. Also if you are creating a Monotangle and your tile screams at you to and more tangles, add them! This is an exercise to explore on tangle at a time, but do not ignore the creative voice when it speaks to you. I will still leave the link, and add it to the slide show, once I get caught up with them. My contribution has a few "filler" designs, but hope it still qualifies for the challenge! It's one of my first ZIAs. Dian, please see my reply to Anne, above for my feelings on "Fillers". Congratulations of doing Zia's. 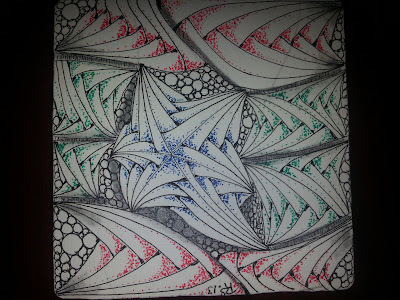 Very fine zentangle! I like colors and the way You have used them. Thank You this interesting challenge. I am new here, but I have wached this challenge for a while. Thanks for your challenges Roy. It makes for very good practice. Although the Adventure is titled Monotangles, it is mostly about focusing on one tangle at a time and seeing what you can do with it. If you need/want to add enhancers to help you become unstuck go for it. The most important thing is that you enjoy yourself, and immerse yourself in the tangle/challenge of the week. Although I have been focusing on "Tangle Adventures" I will eventually have more string/template adventures. I started to think if it is possible to have little picture about this interesting challenge and adventure to my sidepar and others, too, of course. What do You think about it? I have been thinking about it. Now that I am getting healthy, I have a number of things I'll be doing to the blog. I'll add that to the list.